Canada-based provider of oil cargo transportation services Island Tug and Barge Ltd informed that s new ATB push tug the Island Raider has entered service pushing the double hulled refined petroleum products barge, ITB Resolution. The Island Raider is the first of two, twin Z-drive, ATB push tugs for service on the West Coast of North America. Constructed at Island Tug’s Annacis Island Shipyard on the Fraser River, the Island Raider is connected by an articulating pin system to the ITB Resolution which was retrofitted with pin ladders and stern extensions for connecting to the new tug. According to Robert Allan Ltd, who designed the tug, the Island Tug had a well-defined statement of requirements for the tug and a clear vision of the desired layout and accordingly the design was developed in close collaboration with Island Tug. 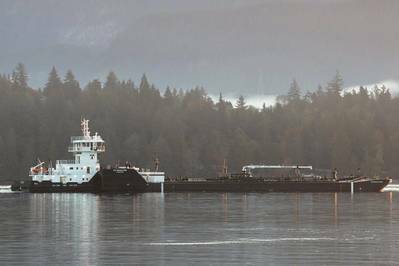 Partway through construction, Island Tug was acquired by Vancouver Washington based Tidewater Transportation and Terminals, with completion of the vessel falling under the direction of Tidewater’s engineering department. Robert Allan’s engineering team, supported Island Tug / Tidewater throughout the design and construction with a detailed and comprehensive design, engineering, and support package. Propulsion machinery consists of two Cummins KTA 38 main engines each delivering 634 kW (850 BHP) @ 1800 rpm connected by Centa hollow carbon fibre floating shafts to Rolls Royce US 105 P9 12FP Z-drives with 1.6 m propellers and with integral slipping clutches. The ATB connection pins are Articouple model FRC 35S designed for 3 m significant wave height. The FRC pin system allows the tug to stay in the notch during all loading/offloading operations by allowing relative vertical movement of the tug and barge while still connected.